T.R. is a physical therapist and co-owner of Abilitations Children's Therapy. She graduated from North Carolina State University in 1997 with a Bachelors degree in Zoology/Premed. She went on to receive her Masters degree in Physical Therapy from East Carolina University in 1999. T.R. 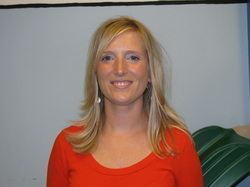 has practiced as a pediatric physical therapist since 1999. She specializes in working with children with neuromuscular and genetic disorders that impact gross motor development, torticollis, orthotic management, and equipment management T.R. also specializes in working with infants and children with obstetrical brachial plexus injuries and visual impairments. She was the P.T. for Governor Morehead School and Preschool for seven years. T.R. has presented inservices throughout the community on gross motor developmental trends in children with visual impairments. T.R. is very knowledgeable in the area of brachial plexus injuries. She works closely with a team of specialists throughout the United States who fully understand and help children with this diagnosis. She has also presented courses in the community on brachial plexus injuries and serves as a consultant for children with brachial plexus throughout the state of North Carolina. T.R. is also very passionate about helping children excel in all areas that promote self confidence. She has established programs throughout Wake County through the years that have promoted integration for children with special needs.